When it comes to loving life, your kiddo is all in. But nothing brings out their giggles, joy, and giddy glee like bathtime! You just have to fill up the tub, add a few suds, and let your tot take in the sensory excitement! Oh, and let's not forget the cornerstone of any bathtime bliss—playing with their beloved rubber ducky! So when your child's first Halloween rolls around, why not take the guesswork out of the equation? Turning them into their favorite toy will tickle their fancy and help them forge Halloween memories they will never forget...probably. Honestly, most babies don't remember much from this time, but the joy on their face while they trick-or-treat will be easily captured in photos and videos that can be enjoyed for years to come! 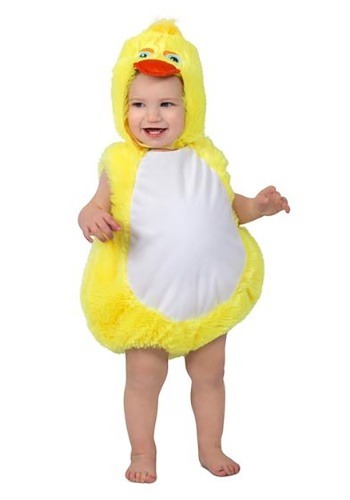 This is a cute-as-can-be duck costume that's simple to put on...but may prove hard to get off. That's because your baby will love wearing it so much, they may throw a tiny tantrum when it comes time to change into their PJs at the end of the night. It features a jumpsuit that fastens in the back in a bright yellow plush "feather," with a cute duck face on its headpiece. This piece is easy to layer over a long-sleeved tee and a pair of leggings if the weather turns cold, so you can keep your little duckling warm as they wind their way down the street, in search of candy! Remember, that cool October weather is a perfect time for a warm bath! Once your little one has lived as a little duck, they may have a whole new imaginative experience in the tub. Just make sure they don't learn to eat their Halloween candy in the bath...uh...we have a "friend" who learned to do that at an early age, and now "candy baths" are a regular routine on a Friday night.